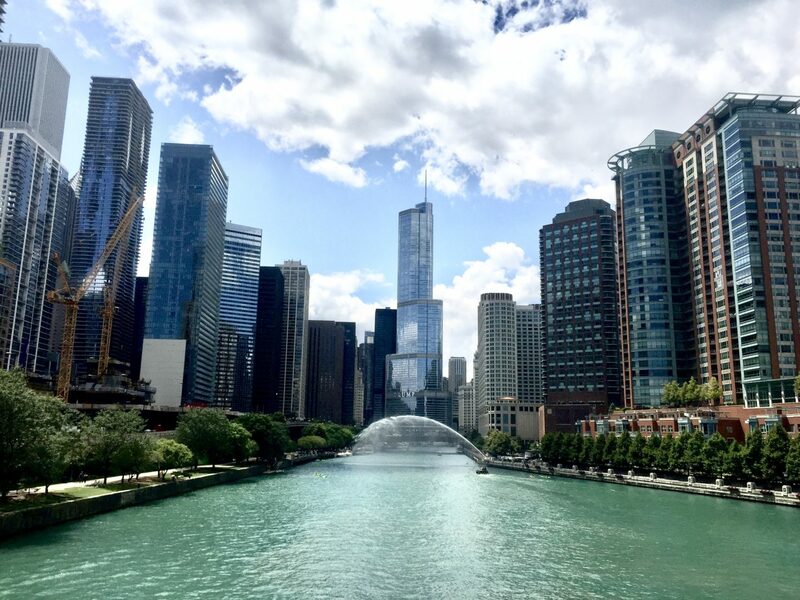 We recently met with the top management of four Chicago-headquartered U.S. mid-cap banks (see related October 9, 2018 “Notes from Chicago – Three Takeaways from the Windy City (Part 2)”). Given their large presence in this giant MSA1Refers to the Chicago-Naperville-Joliet MSA. An MSA is typically a large city and outlying suburbs, analogous to the Greater Toronto Area (“GTA”). MSAs are defined by the U.S. Office of Management and Budget. For simplicity and greater clarity, all MSAs are referred to by their anchor city., it was not surprising that the Canadian banks and their speculated U.S. expansion plans were a frequent discussion topic. 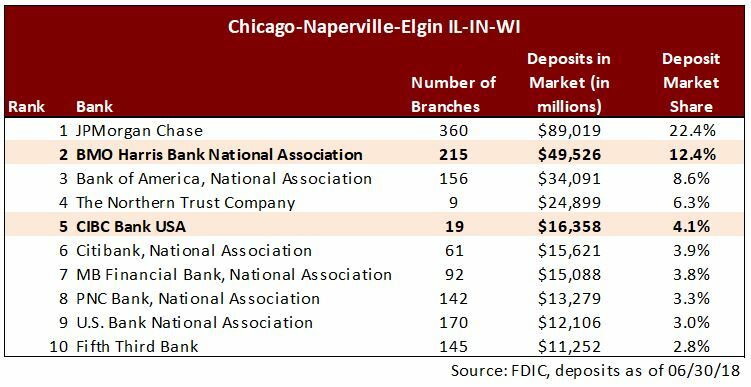 Chicago is the single most important market to Canadian bank investors as it accounts for more than 20% of deposits2Source: Hamilton Capital, FDIC (as of June 30th, 2018). Excludes TD Bank USA deposits in Delaware, which are assumed to be comprised of AMTD sweep deposits. of the Canadian banks’ U.S. banking subsidiaries (combined). Chicago is the mainstay for BMO Harris (~60% of U.S. deposits) and CIBC following its 2017 acquisition of the highly regarded, PrivateBancorp (~90%), since renamed to CIBC Bank USA. In our view, both platforms are of very high quality. However, given Chicago’s relatively poor demographics and softer GDP growth, Hamilton Capital’s U.S. and global ETFs – Hamilton Capital U.S. Mid-Cap Financials ETF (USD) (HFMU.U), Hamilton Capital Global Bank ETF (HBG) and Hamilton Capital Global Financials Yield ETF (HFY) – have limited exposure to the MSA. The ETFs remain very selective when it comes to financials/banks operating in low(er) growth regions. In this note, we discuss the perception of the Canadian banks from that of a U.S. mid-cap bank executive based in Chicago. Chicago, the third largest U.S. MSA by GDP and population (roughly a third the size of Canada), has uniquely poor demographics. Since the last census in 2010, Chicago’s population growth has been stagnant; it ranks 36th in population growth among 40 of the large MSAs (i.e., those with a population greater than 1.5 mln)3Only the Detroit, St. Louis, Cleveland and Pittsburgh MSAs had lower population growth (with the latter two actually shrinking in the last 7 years).. This is in stark contrast to virtually all of the Southeast and Southwest MSAs. Over the same period, the following MSAs are among the fastest growing in the U.S., experiencing population growth of between 1.5% and 2.0% per year: Dallas, Houston, Atlanta, Phoenix, Charlotte, Denver, Orlando, Miami, Tampa, Austin, San Antonio, Las Vegas, and Nashville. By Canadian standards, the Chicago MSA is relatively fragmented. The table below shows the top 5 banks accounting for just over 50% deposit market share, far below the domestic market share of the big-5 Canadian banks. The top 3 banks – JPMorgan, BMO Harris and Bank of America – had a combined market share of ~45%. CIBC Bank USA (formerly, PrivateBancorp) ranks 5th with a market share of 4.1%, despite having just 19 branches (i.e., it has extremely high deposits per branch). First, nearly every bank executive expected the Canadian banks to participate in the ongoing consolidation of the Chicago MSA, allowing them to benefit from their already large existing platforms/deposit bases in the MSA. Second, most CEOs believed that the Canadian banks are at an advantage since acquisitions are “not judged as harshly”, in part because of the differences in how Canadian bank and U.S. bank investors evaluate acquisitions. In Canada, given the banks’ massive size, U.S. mid-cap bank acquisitions are not usually large in the context of the Canadian bank acquirer. Thus, Canadian investors generally focus on: (a) strategic significance, (b) EPS dilution (usually modest), and (c) impact on capital (usually modest). Put differently, U.S. mid-cap bank acquisitions tend not to be highly material, and hence generally do not elicit a significant market reaction, either positive or negative. This is unlike the U.S. banks, where reactions to acquisitions can be sharply negative. The U.S. market tends to focus on: (a) rising execution risk (since buyers/sellers are often closer in relative size), (b) a change in communicated strategy (e.g., the acquirer was expected to be a target, as in the case of Synovus, SNV), and (c) tangible book value (“TBV”) per share dilution, which is difficult to avoid in premium transactions (where there is an equity component). These comments by Chicago bank CEOs are not without merit, and the recent acquisition of MB Financial by Fifth Third is an excellent example. Despite the obvious strategic benefits accruing to FITB by acquiring MBFI – additional scale, expense synergies and notable EPS accretion (7% in 2020) – FITB shares declined sharply. In fact, since announcing the MBFI acquisition in May, FITB’s shares have underperformed the U.S. large-cap bank index by over 10%. We attribute this underperformance to two factors:(a) TBV per share dilution was high at ~8%, and (b) forecast synergies were an extremely high 45% of MBFI’s cost base, implying higher execution risk (through loss of revenues). Third, a couple of executives noted that Canadian banks are seen by some sellers as more attractive partners/acquirers, given they are not expected or required to make severe expense reductions when they make acquisitions. It is possible this perception comes from the fact that the management teams of City National and PrivateBancorp have remained largely intact. What’s Next for the Canadian Banks in Chicago? In our view, CIBC is likely to wait until the market begins to recognize the high quality and accelerating growth trajectory of the U.S. platform before deploying additional capital. Before being acquired by CIBC, PrivateBancorp was very highly regarded by U.S. bank investors and as such, we would anticipate similar recognition by Canadian investors will be achieved. With respect to BMO, its Chicago platform is already very large and of high quality, so there is no strategic imperative to expand further in Chicago, although it is well placed to participate in consolidation of this market. However, it is possible that BMO decides – with good reason – that it has sufficient scale in Chicago, and opts to focus its expansion efforts in other larger or medium sized MSAs in the Midwest, like Milwaukee, Minneapolis-St. Paul and possibly St. Louis. 1 Refers to the Chicago-Naperville-Joliet MSA. An MSA is typically a large city and outlying suburbs, analogous to the Greater Toronto Area (“GTA”). MSAs are defined by the U.S. Office of Management and Budget. For simplicity and greater clarity, all MSAs are referred to by their anchor city. 2 Source: Hamilton Capital, FDIC (as of June 30th, 2018). Excludes TD Bank USA deposits in Delaware, which are assumed to be comprised of AMTD sweep deposits. 3 Only the Detroit, St. Louis, Cleveland and Pittsburgh MSAs had lower population growth (with the latter two actually shrinking in the last 7 years).